More than 5,000 Scientologists and guests celebrated the opening of Orange County’s new Church of Scientology on June 2, 2012. 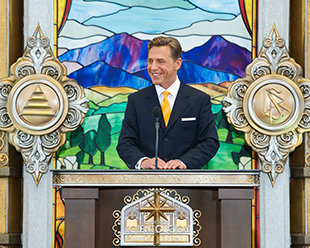 Mr. David Miscavige, Chairman of the Board Religious Technology Center and ecclesiastical leader of the Scientology religion, led the Church’s dedication ceremony. Guests taking part in the commemoration included Anaheim City Council Member Lorri Galloway; Garden Grove Mayor William Dalton; Santa Ana Historic Preservation Society Board Director Maxine Schmidl; Faith in Youth Project Director of the County Community Service program, Ms. Lourdes Gutierrez; and Orange County Interfaith Network Board Member Mike Penn. Church officials and leading Scientologists joined the ecclesiastical leader of the religion, Mr. David Miscavige for the cutting of the celebratory ribbon on their new Church, Saturday, June 2. The Church meticulously restored this nationally registered historic landmark to serve Scientologists and communities countywide. On Saturday, June 2, more than 5,000 Scientologists and guests celebrated the grand opening of the Church of Scientology of Orange County. The Church stands at 505 North Sycamore Street just steps from the birthplace of the city of Santa Ana. In true Orange County spirit, an ensemble featuring hip-hop and Latin dancers performed to a new millennium rendition of “Surfin’ USA” for the grand opening of the new Church of Scientology. The Church of Scientology Orange County celebrated their grand opening on Saturday, June 2 with over 5,000 Scientologists and guests in attendance. Joining in the ceremonial ribbon cutting were Church officials and leading parishioners. Mr. David Miscavige, Chairman of the Board Religious Technology Center and ecclesiastical leader of the Scientology religion (center right), was joined in celebration of the new Church of Scientology Orange County by (left to right): Santa Ana Preservation Society Board Director Maxine Schmidl; Garden Grove Mayor William Dalton; Anaheim City Council Member Lorri Galloway; Project Faith in Youth Director Lourdes Gutierrez; and Orange County Interfaith Network Board Member Mike Penn. The new home of the Church of Scientology stands as the central Church for Orange County. Originally constructed in 1931, the 48,000-square-foot structure is one of the finest examples of Art Deco architecture in the county and is listed on city, state and national registers of historic landmarks. The Church dedicatedly preserved the monument's iconic features, including the decorative façade anchored by a six-story tower. The lobby and reception are now fully restored and ready to receive visitors to the Church of Scientology of Orange County—morning to night, seven days a week. The Public Information Center provides visitors a self-guided introduction to Dianetics and Scientology and the Church’s numerous humanitarian and community initiatives. These include a worldwide human rights education program; an equally far-reaching drug education, prevention and rehabilitation program; a global network of literacy and learning centers; and the Scientology Volunteer Minister program, which is now the world’s largest independent relief force. The grand Chapel and Auditorium, its Tudor arches, decorative grills and original millwork meticulously restored, provides the setting for a host of Church ceremonies and activities, including Sunday Service open to all. The grand Chapel and Auditorium serves as an ideal venue for civic occasions, including formal banquets. It is also designed to host seminars, workshops and gatherings in the name of community collaboration for the betterment of Orange County. The café is open daily for the convenience of parishioners participating in Scientology services and for those visiting the Church. The Church’s bookstore offers L. Ron Hubbard’s scripture of Dianetics and Scientology in both English and Spanish. The entire body of knowledge comprises tens of millions of published words and thousands of recorded lectures, available in 16 languages. The Hubbard Guidance Center is where Scientologists participate in auditing—Scientology spiritual counseling. Beyond this waiting area are dozens of auditing rooms to meet the needs of Orange County’s growing congregation. The Academy is where Scientologists train to become auditors (spiritual counselors), capable of applying the technology of auditing to help others attain spiritual freedom. The Orange County Academy comprises an entire floor of the Church, with multiple course rooms, each devoted to a different aspect of training. The Knowledge Center, located in the building’s central tower, contains a complete library of L. Ron Hubbard’s works on Dianetics and Scientology for use by parishioners in their studies. The Church includes a biographical exhibit on L. Ron Hubbard, presenting his life and legacy. In the background stands an office in honor of the Scientology Founder. 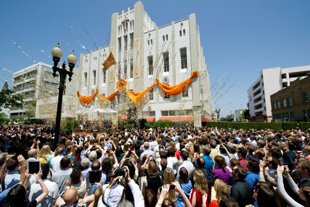 The Church of Scientology dedicatedly restored its new landmark Orange County home in downtown Santa Ana, including the iconic Art Deco façade. Among the many historic elements of the interiors returned to their early 20th century splendor is the original ballroom, which now serves as the Chapel and Auditorium venue for community-wide gatherings and events. The Church of Scientology of Orange County’s new Ideal Org, an historic landmark originally built in 1931, stands fully restored to its early 20th century splendor—including the Sycamore Street entrance with its etched glass doors, original stone relief and wrought iron lamps. Among the most distinctive historical elements preserved by the Church in this Santa Ana landmark is the exquisite, hand-carved mahogany staircase leading from the grand lobby. After acquiring the historic landmark, the Church conducted meticulous renovation to preserve its original features, from the hardwood floors to the glass and alabaster chandeliers. On Saturday, June 2, city and state dignitaries joined thousands of Scientologists in downtown Santa Ana to dedicate the new Church of Scientology of Orange County. Mr. David Miscavige, Chairman of the Board Religious Technology Center and ecclesiastical leader of the Scientology religion, dedicated Orange County’s new Church of Scientology. The Church’s new home, located at 505 North Sycamore Street, most recently served as the Santa Ana Performing Arts and Event Center. The 48,000 square foot building was originally constructed in 1931 as the Santa Ana Masonic Lodge. It remains one of Orange County’s finest examples of Art Deco architecture and is listed on the city, state and national registers of historic places. The Church of Scientology faithfully restored and preserved the structure, including its iconic facade anchored by a six-story central tower. The Church further returned the building’s ornate interiors to their former glory, from the alabaster chandeliers and hand-painted ceilings to the carved mahogany staircases. The landmark third-floor ballroom once again stands as a gathering place for the community, serving as the grand Chapel and auditorium venue for parishioners and people of all faiths in Orange County. Among those on hand to welcome Orange County’s new Church were Anaheim City Council Member Lorri Galloway; Garden Grove Mayor William Dalton; Santa Ana Preservation Society Board Director, Ms. Maxine Schmidl; Orange County’s Faith in Youth Project Director of the Community Service Program, Ms. Lourdes Gutierrez; and Orange County Interfaith Network Board Member Mike Penn. This new Church opens its doors to provide Orange County residents with an introduction to Dianetics and Scientology. Visitors are invited to take a self-guided tour of the expansive Public Information Center, presenting informational and documentary films on every aspect of the religion, including the life and legacy of Founder L. Ron Hubbard. The Information Center also offers a detailed overview of Church-sponsored humanitarian programs, including a worldwide human rights initiative; equally far-reaching drug education and rehabilitation programs; a global network of literacy and learning centers; and the Scientology Volunteer Minister program, comprising the world’s largest independent relief force. In full, the Center’s multimedia displays present more than 500 films, available at the touch of a button. The Center is open morning to night for visitors to tour at their leisure. Orange County’s new Church further includes expansive facilities to provide Introductory Services to those new to the religion, including Dianetics and Scientology Personal Efficiency seminars and an array of Life Improvement Courses. The Church also provides dozens of rooms dedicated to the delivery of Scientology auditing (spiritual counseling). The new Church of Scientology of Orange County is the fifth Ideal Church of Scientology to open in California since 2010. Other Ideal Organizations (Orgs) opened this year include: the Church of Scientology Greater Cincinnati, February 25, 2012; the Church of Scientology Sacramento, January 28, 2012; and the Church of Scientology Hamburg, Germany, January 21, 2012. Further new Churches opened in recent years include Minneapolis-St. Paul, Minnesota; New York, New York; Washington, D.C.; Tampa, Florida; Nashville, Tennessee; Seattle, Washington; Las Vegas, Nevada; Los Angeles, California; Pasadena, California; Inglewood, California; as well as Quebec City, Canada; Mexico City, Mexico; London, England; Melbourne, Australia; Brussels, Belgium; Madrid, Spain; Rome, Italy; Berlin, Germany; and Moscow, Russia. More than 10 new Ideal Orgs are further scheduled for grand opening in 2012. For a complete list of new Churches of Scientology, visit Scientology.org.